Starlite Vaulters is So Cool! I think vaulting is so fun because I have a great team. We are called the Starlite Vaulters. It is so fun because my vaulting coach likes to spend time with us so when we go to competitions we win ribbons. Alethea spends three hours twice a week. I have vaulting every Monday and Friday. We are in parades like the Christmas parade and the Clovis Rodeo parade. Alethea trains us to be great competitors and good sports. In the summer I think vaulting is the best because Alethea lets us swim in her pool after vaulting. I like Alethea's husband, Paul because after vaulting he will play with us and even sometimes in the summer he will swim with us. Alethea and Paul have a baby boy, Jesse. He loves to be with the vaulters and someday he will be part of the team. Alethea has the nicest family. Alethea has two great vaulting horses named, Rosie and Natasha. She has taught us to take good care of them. So they will trust us and we will trust them. 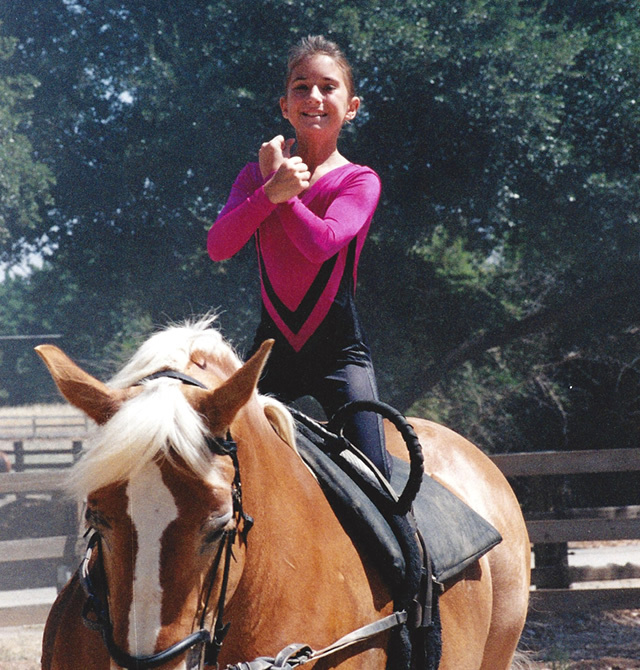 Thanks to vaulting I am more responsible, confident, and a much better horseman.